The Idiot’s Guide to Homebrewing: My First Book and Some Mega Thanks! Readers of the Apartment Homebrewer blog may have noticed a few changes over the past year, namely the reduced frequency of posts and a couple of hints at a winter project. While I was away from blogging (and currently slowly getting back into it), I was still very busy writing about homebrewing. Keeping this project relatively quiet for nearly a year, I am excited to announce the upcoming September 2015 release of my first book, the Idiot’s Guide to Homebrewing as part of the Idiot’s Guides series. How I came to author the Idiot’s Guide to Homebrewing? Already very busy as a full-time graduate student, I thought I’d still put in my proposal for the book (a table of contents and sample chapter) into the handful of other proposals since I felt regarded enough to be approached as a possible author. My expectations were very low, thinking that editors wouldn’t go forward with my proposal, but at least gain some experience in the “writing a book proposal” process while also not regretting withholding a proposal altogether. Surprisingly however, the Alpha Books team were very impressed with my proposal especially for a first time author, and decide to go forward with my book idea. Thus, in October 2014 (around the same time the blog posts starter to dwindle), I signed on for the homebrewing book, and in November 2014, started writing a 350+ page manuscript to be edited and formatted into a 400+ page book. Having never written a book before, I was excited to deliver on this opportunity but at the same time terrified having signing myself up for a very large responsibly as well as committing myself to zero life for several months. Through November 2014 to March 2015, I completed the 350+ page manuscript, which through the creative process evolved into a book totaling 22 chapters and 4 appendices on introductory homebrewing at all levels. After its submittal, the editing and supplemental material writing process started, all of which was completed at the end of May 2015 (to my relief). And now, with September 1st, 2015 approaching, the hard work of myself, editors, and the Alpha Book team is launching the Idiot’s Guide to Homebrewing (hopefully surrounded with positivity) to new homebrewers soon! What’s in the Idiot’s Guide to Homebrewing? 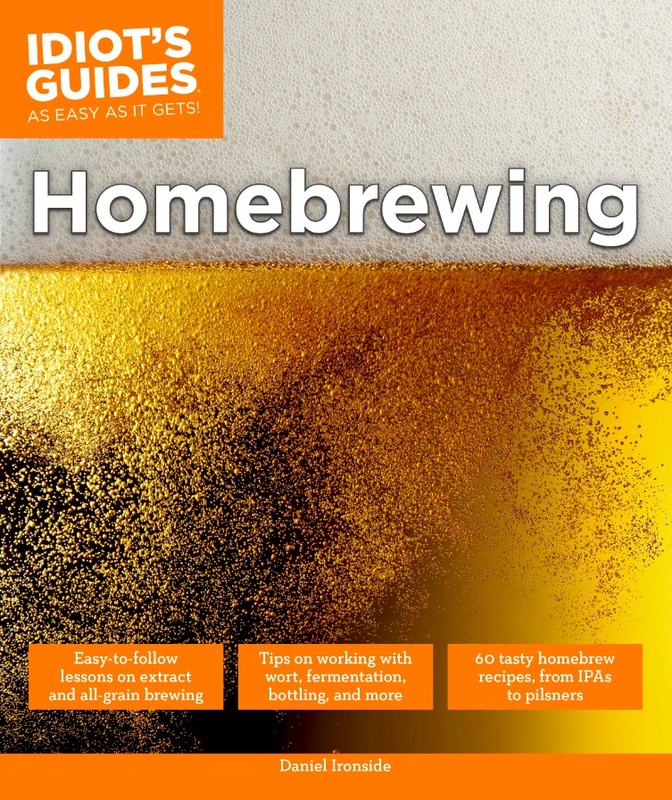 My goal with the Idiot’s Guide to Homebrewing was to provide valuable, up-to-date homebrewing knowledge coupled with practical how-to brewing instruction both tailored to the homebrew scale. In doing so, I strived to layout the wide spectrum of homebrewing into a “linear as possible” track as a way to most easily breakdown the wide array brewing processes as well as build a strong foundation on a chapter-by-chapter approach. As mentioned previously, the final book has a total of 22 chapters and 4 appendices. For organization sake, the chapters are organized into 7 parts, each designed to dive into a particular aspect of homebrewing as listed below. Part 1: Welcome to Homebrewing is the barebones introduction to homebrewing focusing on getting you brewing before getting into the finer points of the brewing process. Includes two chapters on how to get brewing with extract STAT! Part 2: Brewing Ingredients covers the four primary brewing ingredients (malt, hops, water, yeast) and other commonly used brewing ingredients (like fruit, coffee, sugars, etc.) over five chapters. Part 3: Brewing Necessities is a three chapter section that explores the wide range of brewing equipment, importance of cleaning and sanitization, typical brewing measurements/recordkeeping used throughout the brewing process. Part 4: The Brewing Process revisits the summarized version in Part 1 and over three chapters breaks down each step of the brewing process starting from wort production, exploring fermentation and its variables, and ending in packaging. Part 5: Evaluating Your Homebrew focuses on the results of your first homebrew by understanding the beer you made and improving upon it. In three chapters, this part demonstrates concepts like tasting evaluation, common flavors (and off-flavors) as well as how to troubleshoot common homebrewing problems. Part 6: Becoming a Brewmaster introduces the beginner brewer to more advanced brewing topics like all-grain brewing (over three chapters) and advanced fermentation (in a single chapter). 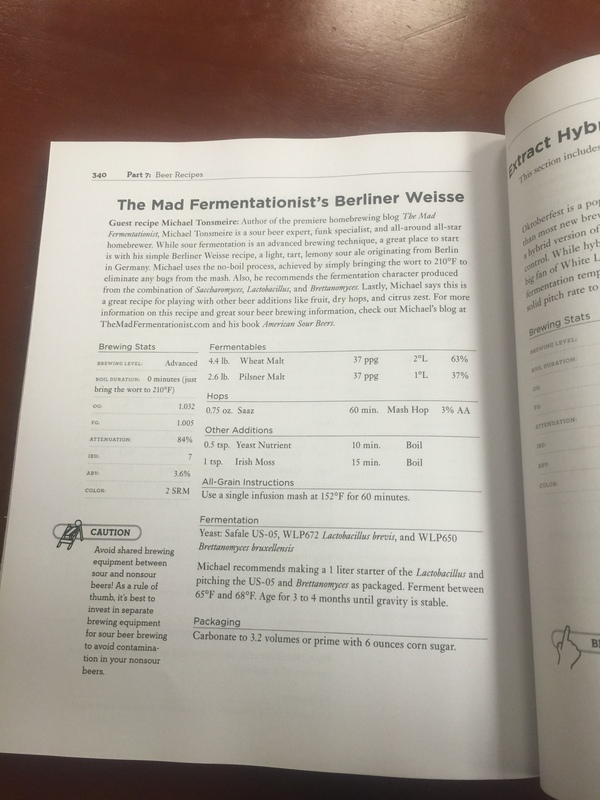 Part 7: Beer Recipes unsurprisingly provides the new brewer with 60 extract and all-grain recipes as well as an introduction on how to read a beer recipe. Also discussed is how to perform recipe conversions like extract to all-grain. The beer recipe chapter in particular includes 16 guest recipes for well known homebrewers (see more on this below) throughout the homebrewing community. While doing my best to guide new homebrewers though the creative and technical aspects of homebrewing, I also wanted to make sure new brewers branched out beyond this introductory text. Specifically, since the target audience will likely be some somewhat outside the homebrew network (for example as a gift to a spouse or friend), I wanted to point the new brewer to as many great resources for future learning. In doing so, I made a strong effort to point out key brewing resources throughout the text since this introductory guide barely scratches the surface. A mega thanks to some awesome people! While there are similar acknowledgements in the book, I wanted to reiterate them here because I am truly thankful for all of their support and efforts. Starting out, I would like to thank Brook Farling and Ann Barton (development editor aka the person who had to read and frequently correct for my untrained writing) for selecting me to undertake this project as well as patiently guiding throughout my first manuscript, editing, and general book writing process. In addition, I would like to thank the Alpha Book team (many who I never conversed with) for doing a great job with the cover, formatting, indexing, and illustrations (seriously great work). On the brewing front, I’d also like to forward my many thanks to the homebrewing community at-large. Specifically, I’d like to thank the 16 guest brewers listed above for providing guest recipes and providing some editing and feedback in regards to their recipes. On the same note, I’d like to give a very big thanks to Marshall Schott, who not only provided a recipe but also served as the technical editor for the book. As the title suggests, Marshall was responsible for making sure the technical content of the book was accurate. Not only were his edits eagle-eyed, he also provided many helpful suggestions to improve the quality of the book. And for that I deeply thank the great Brulosopher! Beyond the guest brewers, I like to give a quick thanks to Brew Dudes for providing a photo for the book (see the cooler mash tun photo in Chapter 18). And last but not least, a super premium thanks to my homebrew club Austin ZEALOTS, the community with which I learned how to brew world-class beer at home. As always, cheers and happy brewing! Congratulations! What a great accomplishment, I’m so glad I was able to help. Congrats! I’m definitely interested in posting a review of your book. Be in touch. Cheers!